Big downdrafts at Olfactarama and BitterGraceNotes contributed to a five point drop in the Solo Blog Index. This week also brought a shakeup to the SBI roster. GlassPetalSmoke plummeted to an Alexa ranking of 28.1 million, down from the 3.9 million it held when site owner Michelle Krell Kydd last posted on December 30, 2009. Blogs have rebounded from such low rankings before, but only when actively maintained. The point of the SBI is to measure ongoing interest in our smelly corner of the blogosphere and including an abandoned site only clouds the picture. Accordingly, I've decided to delist GlassPetalSmoke; I wish Michelle the best in her other endeavours. Replacing GlassPetalSmoke on the SBI is SorceryOfScent, run by fragrance blogger Dimitri. 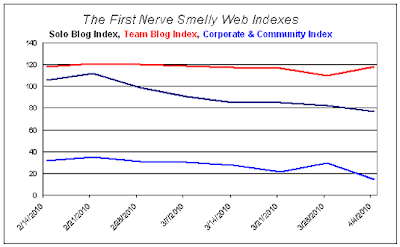 The Corporate & Community Site Index resumed its steep descent with a sixteen-point drop; all four sites lost altitude. The Team Blog Index provided the only positive news of the week with an eight-point bump. 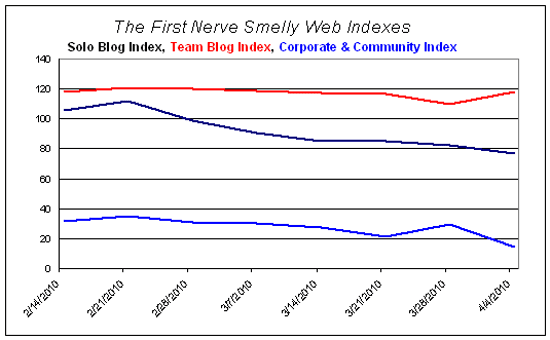 The LongView: A glance at the performance of the Smelly Web Indexes since their inception (below) reveals two trends. The SBI and the CCSI have been on prolonged and alarmingly steep descents while the TBI has maintained a steady altitude. This raises some questions: What, if anything, do large, high-resource corporate and community sites have in common with those run by solo practioners? And what is it about team blogs that pulls consistently steady rankings? Is it topic matter, posting frequency, multiple voices? I'd venture the discrepancy between team blogs and both solo blogs and corporate sites is due to the frequency of posts. I only have the time to follow a handful of blogs, but the two I most regularly read are collective. Now Smell This and the Perfume Posse post daily -- NST often posts several times a day, so I know that I can pop in there often for new content. The way their comments are presented also allow discussion between the commentators, which prompts further visits, since I go back to read the discussion as it unfolds. On the other hand, solo blogs like mine post much more irregularly, and I don't really need to catch up with them more than once a week. As for Sniffapalooza magazine has a monthly issue, so once that's been looked through in a couple of visits, I don't go back until a new issue is announced. Osmoz doesn't publish many longer pieces and I mostly visit it to consult the database. Also, solo blogs seem to be multiplying at a rather high rate and that might disperse the readership of the ones you index. Hope that answers part of your question. Well I guess I must have a negative number of readers these days. Is the SBI a reliable indexer of a readership of less than zero? Sounds to me like you're a typical blog reader--the pace of your visits tracks the rate at which new material is posted. I used to assume that corporate/community sites shared a frequent-visit advantage with team blogs; the idea being that a big community site would always have bits of new material here and there and be as fresh as a multiauthor blog. Guess I was wrong. I think you're on to something regarding solo blogs. There's a high birth rate but also a high death rate. Among the 19 sites on the Solo Blog Index, some are just bean sprouts on their slow climb to the big time, others are senescent (blogging is hard work and burnout is a fact of life), and a sterling few manage to hold a steady altitude. This is a tough thing we've chosen to do. There's an inertial aspect to these traffic rankings. Like flying a plane, you have to keep the nose up and constantly climb, otherwise gravity wins and you lose altitude. FWIW your Patti Smith post really resonated for me. Keep the balls to the wall.